While I'm pining away for spring, the men in the family are busy enjoying winter! Their adventures recently took them miles through a snowy forest to a beautiful lake bed, frozen over and enticing a few brave souls to glide upon it. Happy adventuring, menfolk. While I'm earnestly seeking spring, they are content in the moment. (I'm sure there is a lesson here for me). Hope you are doing well, sweetie!! Have a simply delightful week!! The snowy beauty is breathtaking. But, alas, I too am pining away for Spring. Although, there is a lesson there too. We truly must live in and enjoy the moment. Each day is precious and the seasons are beautiful. Beautiful photos they caught. 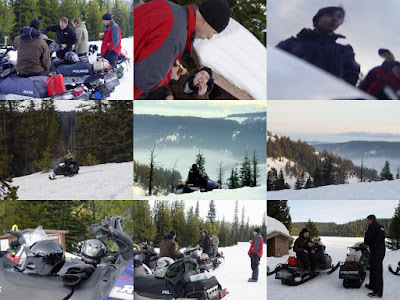 I've always wondered what it would be like to go snowmobiling as I've never been. There are trails all around that go for miles and miles...a regular highway from one end of the state to the other...I've always wondered what it would be like to be in the dead of the forest in winter. Looks like they are having lots of fun! Do you ever ride with them?